Q: So, David, you are a gay men’s therapist, with a special background in working with gay fathers. Tell me how you got to be working with gay dads? Q: Do either of your children have special needs? A: My younger son was diagnosed with ADHD (Attention Deficit Hyperactivity Disorder) and dyslexia by first grade. We worked with him and got him into a special school, with extra support. He was actually born female, but at about age 14, transitioned to male. He was totally self-directed. It wasn’t a total shock, but it was a surprise. He changed his name at about age 14 ½, cut his long, curly hair, got a new wardrobe, and went on hormone blockers to stop his period and just put everything developmentally “on pause” with his body for about six months, so that we could all catch up, as a family, psychologically. Then he went on Testosterone supplementation. At 15 1/2, he underwent top surgery (breast removal). He used to go away to a 7-week summer camp in Maine for many years in the girls bunk, and then about two years ago spent two successful summers at the same camp in the boys’ bunk. Q: Some of our “conservative” friends might question an adolescent making permanent surgical decisions as an adolescent, when adolescents can change their minds about lots of things. How do you answer those critics? A: That was a big concern, and a big question, even on the day of surgery. “Are we doing the right thing? Will he ever change his mind?” And so, our thought process was that he was living as a boy for well over a year, we didn’t see that changing at all, he wasn’t giving any indications of questioning that, and as a boy, having breasts was really getting in the way of playing sports on boys teams, and really getting in the way of his self-esteem. His body was not in alignment with the way he felt inside and wanted to look on the outside. We consulted a number of professionals; he was in therapy for about a year, and it was totally his decision. We thought, God forbid, if he ever did change his mind, although it would be irreversible, there would be options. It was something that he felt very, very strongly about, and we wanted to honor that. But it was a hard decision. The other factor was that I did not want him becoming depressed because of the way he looked which is so typical for trans kids. Q: You’ve got a special role in our community. You’re a therapist, you’re a father, you’re a gay man, you’re the father of a trans child, you cover a lot of bases in your own experience. If the parents of child who is probably trans are reading this, what’s your best advice for them? A; It depends on how old the child is. If possible, if you can pause changes that are happening in the body, if you can use hormone blockers, those are not irreversible. Do research. I did research, I became friendly with a family in our neighborhood who was a little older than our child, and they resisted surgery, and that child attempted suicide. There is a high percentage of trans children who are depressed and attempt suicide, and I did not want to take that risk. I was willing to support the risk of his changing his mind, than to risk his become depressed or even suicidal. Above all, love your child even if they seem different than what you expected. Show your love as often as possible because your child needs your support now more than ever regardless of their age. Q: If a parent starts to notice gender non-conforming behavior, how does a parent know that their child might be trans, versus gay or lesbian? The tomboy lesbian, or the effeminate boy? A: We’re talking about sexual orientation, whom you’re attracted to, and gender identification is about how you feel and see yourself. Those are two different questions for every developing child. For most kids, there are signs of transitioning. Even at age two, it can be obvious, or another time might be adolescence, or even adulthood. For us, we had experiences of our then, daughter, being a tomboy and wanting to wear basketball shorts and a tank top to school every day, and even wanted to wear boys’ underwear, briefs, not girls’ underwear. We had a religious holiday, and he refused to wear a dress. He wanted a suit. And he was very happy that we bought him a suit instead, for Rosh Hashanah. So, there were those indications. Around the age of 12 or 13, he tried to conform by becoming ultra-feminine with makeup, dresses, had his hair straightened, had a Bat Mitzvah, had a boyfriend, and, then, it just became too much for him, and it was almost overnight that he said, “I’m really a boy”, and this is how I want to live, and immediately changed his name at school and among his friends. For parents, I would be open-minded, I would ask your children questions, find organizations out there that can be supportive, and read! Find books! Do research! 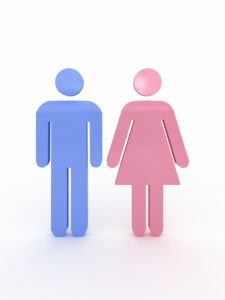 Q: What about in relationships, if one parent is supportive and one is not, of their child transitioning? What are the issues in a couple? A: I think it’s a lack of education. They need to educate themselves, and understand that gender non-conforming people have been around since the beginning of humankind. There are books and materials in all cultures. They need to see things from the child’s position, and have a sense of how detrimental it could be for that child to not transition in some way – that might mean slowly and in phases. Maybe try to do it gradually, and see how it goes. Maybe it’s not everything all in one week, like over three months, six months or a year. You can cut your hair, it will grow back. You can buy different clothes. You can change the names you use. There are things kids can experiment with that are reversible, even hormone use. And you want to have professional help, someone who knows the issues, and can be really supportive of both your child, and you. And there is a grieving process. Parents need to grieve that their “daughter” is no longer going to be their daughter, or their “son” is no longer going to be their son. That’s very real, and parents need the space to grieve. They could do that in couples therapy. Q: How would the parent of a trans child work with schools? A: It depends on the state they live in, and the culture about this issue. First, the child needs to feel safe. They won’t do well in school, or in life, if they don’t feel safe at school. The school should have a gender-neutral bathroom, and there should be some education ideally for both faculty and for other students. The Gay Lesbian Straight Education Network (GLSEN.org) is a great organization for LGBT issues in schools, and a great reference resource. Q: What does a parent do if they learn about bullying of their child, either from fellow students or from faculty? Or if they learn that their child is being called by a different name than what they want to be called, or if the school is doing anything that the parents see as harmful? A: This is very serious and obviously parents need to stand up for their children and protect them as needed. I hope that they would find an ally that could help support the child and family. If they can’t, they might need to find another school. Or pursue their legal rights, which will vary from state to state. Not all states have legal protections for gender identity or expression, but some do. But the child needs to feel safe. Being bullied can lead to serious depression and even suicide so its vital for parents to ensure their child is in a safe and supportive environment. Q: How would a parent know their legal rights? A: Just searching “trans rights”, or Human Rights Campaign (www.HRC.org), which is national, or online resources. Q: How would parents work with the child’s siblings? Or grandparents that don’t understand what’s going on in the family? A: Siblings might need their own support, especially from professionals who can explain things in an age-appropriate way. There are some wonderful letters on the Internet that people have posted that they have used to educate others, and announce their child’s transition to family and friends, and there are a bunch of great, heartwarming books about kids who have transitioned, and share those with family members. And to know they are not alone. A recent study from the New York Times reported that about one in about 137 teenagers identify as trans or gender non-conforming, with a breakdown by state. It’s at least 150,000 teenagers in the United States. So, parents are not alone. If there isn’t a local support group, there are certainly support resources online. Q: Let’s talk about your work with gay dads. At GayTherapyLA, we have both single and coupled gay men with an interest in becoming fathers. For a gay couple who is ready to have kids, what’s your advice for the first step for a gay couple to move toward parenthood? A: I think you start by talking with each other about what that would mean. Why do you want to have children and are you willing and excited about your life changing forever. How your lives would change with children, and how they would be enriched, but to be honest, to know there would be some big changes. How would they both, individually and as a couple, deal with those changes. There are all kinds of practical matters: the size of your home, safety issues, pets, family, who would take care of their child, such as a stay-at-home parent versus a full-time nanny. Religion! Something that many gay men don’t think about, but when you have children, that issue might come back into play. How are you going to raise your kids? What about discipline? Think about how you were raised; what worked for you? What didn’t? How would you like to be different from your parents? And how you become parents. Does that mean surrogacy? Adoption? Foster care? There are so many different options right now, and options for everyone’s budget, too. You don’t have to have a lot of money. You can adopt through the state, and the state will help educate your child, with clothing, food, medications, health care, especially if you’re open to a child of mixed race, or special needs, or an older child. Do you want a baby? A toddler? An older child? I would start there. 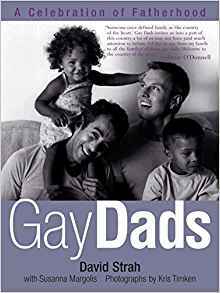 And try to get involved in organizations with other gay dads, and find out from them how their lives changed, and how they became dads. I was never asked so many invasive questions before becoming a gay dad! And I became a dad 20 years ago, and it was a different time. You have to be prepared to be asked questions that other parents don’t get, like, “Where is your wife? Who is your wife? What race is your wife? Where did your child come from? How much did you pay for your child? Are you the Manny? Are you the uncle? All kinds of stuff. Even, “are you gay?” And you can be met with some hostility, because not everyone thinks gay men should be fathers. Q: How did you answer that classic anti-gay statement, “a child needs a mother and a father”? A: A child needs a forever, loving family. And it doesn’t matter if it’s two dads, or two moms, or one mom, or one dad. Period. The science backs this up. And the reality now, in America, is I think that less than 50 percent of kids grow up in families with one mom and one dad. We still have a very high rate of divorce, about 50 percent, and many kids grow up in blended families. So, it’s just a reality. And let’s not forget that there are hundreds of thousands of children in the United States who need to be adopted and have a forever family. Q: What about the notion that a child of color needs to be adopted by parents of color, in order to understand their cultural identity. What would you say to that? A: I think it’s definitely valid that kids of color have different issues. We live in a White-centered society, and that’s changing, but it hasn’t fully changed. Having said that, White parents can certainly help their kids of color be proud of their race and their background, but kids still need a home, a loving, forever family, and that’s more important than if they share the same skin color. You can help them understand their culture by talking about it, you provide books, and there are wonderful books for kids who can’t even talk yet, or all ages. You try to instill a sense of pride, through books and movies, about people who look like your child. You talk about it, and go to museums and cultural events. You make it a priority. Q: How did you handle Mother’s Day? A: Our kids never missed it. They have two dads; that’s their life and they don’t really know anything different. How does a fish know it’s in water? That’s their perspective; they don’t know anything different. We definitely do something for Fathers Day. I think the broader question is female involvement. Most teachers are women, most caregivers are women, so both my kids from nursery school through high school, had babysitters or nannies who were women, and they are lucky they have three aunts who have been involved in their lives, and three grandmothers involved in their lives, too. So they have always had a very strong influence from women. Q: You’re a therapist who helps gay dads, in particular. You literally wrote the book! (Gay Dads:A Celebration of Fatherhood). Why did you write the book? A: This was nearly 20 years ago, and back then, being a gay dad was much more rare, and there wasn’t a lot of representation out there in any medium. Back then most gay men had to make these almost heroic efforts to become dads, especially if you were out as a gay man. I spoke with so many gay dads who all had incredible stories. I felt their stories were important to tell, and I wanted my kids to see families like their own reflected in a book and to encourage other people who were thinking about becoming a dad, to see how it can be done. There are 24 different families who became fathers through adoption, surrogacy, foster care, and with women. Most of the stories are about two men, but I included some single dads, too. The adoptions are both in the United States and abroad. Q: How do you help gay dads in your work as a therapist? How do you help them? A: There are the usual challenges of parenting, but also how it’s also looking at how are we different as gay men, or in the LGBT community, and our needs differ from other people. And I certainly think that homophobia plays a part in that, and looking at how we might put a lot of pressure on ourselves and maybe even our children, to be “perfect”. And looking at the support we are giving, and receiving, from our families, friends, or religious organizations, but not everyone gets that. Trying to find support in other places as needed. Working with schools and being proactive to ensure that they are providing a safe, sensitive environment for their children. One of the things I encourage dads to do is buy the books they would like their school classroom to have so their children see their stories reflected and shared with their peers and talk about how they would like to be called and trouble shoot any problems. Q: What’s the most common issue you see with gay dads in your therapy practice? A: I think there are many men who are fearful to have children. One partner is usually more fearful, and the other guy takes the lead. Then the other partner really catches up. It’s amazing to witness how a new parent’s heart expands, and how they fall in love with a child they didn’t birth, or share the same genetics and might look really different from them. But their hearts do expand and they experience an incredible bond with their child and so much love. GayTherapyLA is the oldest and most established psychotherapy and coaching practice specializing in services for gay men and gay male couples, founded by Ken Howard, LCSW, and based in Los Angeles, offering services in office, or consultations via phone or webcam to people all over California, the United States, or anywhere in the world. For more information on therapy, counseling, or coaching, or to book your appointment, call or text 310-339-5778, or email Ken@GayTherapyLA.com.